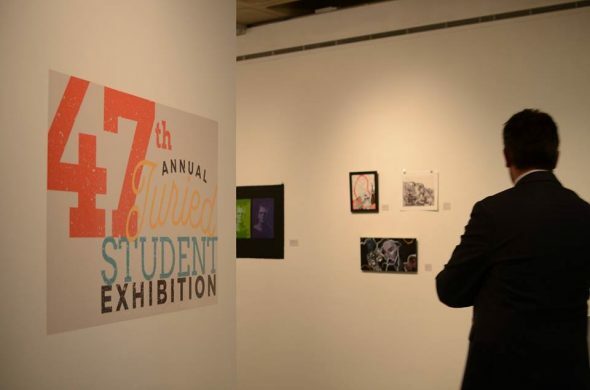 The Anderson Gallery recently celebrated the opening of the 47th Annual Juried Student Art Exhibition, which showcases 65 works of art by 32 current Drake students. The gallery opened with a public reception and award ceremony on March 25, and runs through Sunday, April 22. The exhibition accepted submissions in nine categories—drawing and works on paper, graphic design, interactive media, painting, performance, printmaking, sculpture, installation and video—and gave awards in six categories. 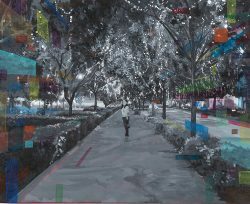 Visiting juror Matt Coen, an Iowa State University alumnus and principal in Walker Coen Lorentzen Architects, Inc., selected the 10 award recipients and featured artworks from 120 student submissions. Coen is a frequent reviewer of student work at Iowa State University’s College of Design. With the featured artwork, students “demonstrated an application of technical skill and knowledge in their category, a trajectory towards achieving excellence in their discipline, and conveyed an emotion, asking the viewer to interact with the piece,” Coen said. “If” by Grace Lim. Photo by Rich Sanders. Maddie Snell, best in category (Sculpture). Additionally, President Martin awarded the “Provost Purchase Award” to student Ellyn Ross. Her untitled steel rod sculpture will be purchased by the University and placed in the Provost’s office after the exhibition. The annual juried exhibition features work by students from all studio and design disciplines within the Department of Art and Design. The Anderson Gallery was established in 1996 as a dedicated space for the exploration of contemporary art and design. Additionally, the gallery hosts curated exhibitions of historically significant work, as well as annual showcases of student work from the Department of Art and Design. The gallery is a not-for-profit branch of the department, occupying a versatile 1800 sq. ft. space on the first floor of the Harmon Fine Arts Center. The gallery is open Tuesdays, Wednesdays and Fridays 12-4 p.m., Thursdays 12-8 p.m., as well as Saturdays & Sundays 12-4 p.m. The gallery is closed on Mondays and during University holidays. Additional information is available by calling (515) 271-1994 or by visiting theandersongallery.wordpress.com.